Ground bison is a good alternative to regular ground beef, says The Kitchn food writer Regina Yunghans. 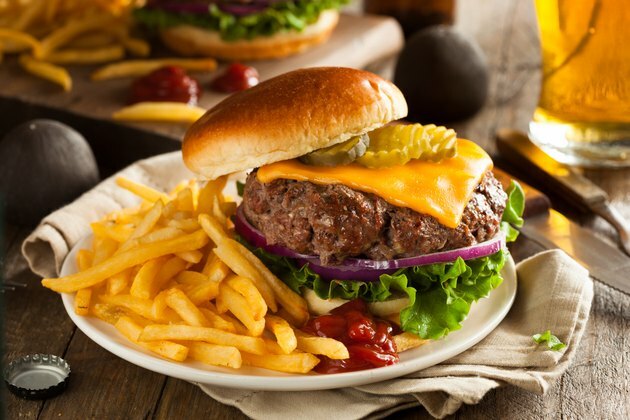 While a 3-ounce patty prepared from 70-percent lean ground beef has 183 total calories, 12 grams of fat and 4.8 grams of saturated fat, 3 ounces of cooked ground grass-fed bison features 152 calories, 7 grams of fat and 3 grams of saturated fat. In addition, the National Bison Association reports that the meat is free of any added chemicals or hormones. You can substitute bison in any recipe that calls for ground beef, but you'll need to cook the meat more slowly, at a lower temperature. To grill ground bison burgers, you'll need to cook them over no higher than medium heat to prevent the patties from drying out and becoming tough. For a gas grill, this is 350 to 400 degrees Fahrenheit; a charcoal grill has reached the correct temperature when you can only hold your hand 3 inches above the grate comfortably for four to five seconds. Grill 1/2-inch-thick ground bison patties with the lid down for approximately two to three minutes on each side or until an instant-read meat thermometer registers 160 degrees Fahrenheit. Use browned ground bison crumbles as a substitute for the same amount of browned ground beef in dishes like tacos, spaghetti sauce, soups, enchiladas or chili. Heat a nonstick skillet over medium heat, add the ground bison and allow it to cook, stirring it frequently. Do not raise the heat or the bison may scorch. When the meat shows no visible pink, drain off any accumulated fat and use the cooked bison as desired. Although ground bison is lean, you can further reduce the fat content by putting the cooked meat in a colander, then rinsing and draining it with hot water before using. Substitute ground bison for the ground beef in your favorite oven-friendly recipes like meatloaf or meatballs. After combining the ground bison with the rest of the required ingredients -- breadcrumbs, eggs, milk, tomato paste, chopped onions and seasonings, for example -- use your hands to gently mold the mixture into the desired shape. Ground bison meatballs should be baked at 350 degrees Fahrenheit for approximately 15 minutes, while ground bison meatloaf needs about 60 minutes at the same cooking temperature. Do not eat either until you've confirmed that the internal temperature of the meat has reached 160 degrees Fahrenheit. If you don't have a grill or the weather isn't conducive to outdoor cooking, use your broiler to prepare ground bison burgers. The Wisconsin Bison Producers Association, however, cautions that you'll need to position the patties farther away from the heating element than you would normally do for beef patties. Place the formed ground bison patties on a rack positioned in a rimmed baking sheet. Put the baking sheet in the middle of the oven and broil for approximately 10 minutes, or until the internal temperature reaches 160 degrees Fahrenheit. The Kitchn: What's the Deal With Bison Meat?